Get all the goods in Denver. Photo courtesy of Hotel Teatro. Art museums filled with abstract paintings and Native American heapieces. 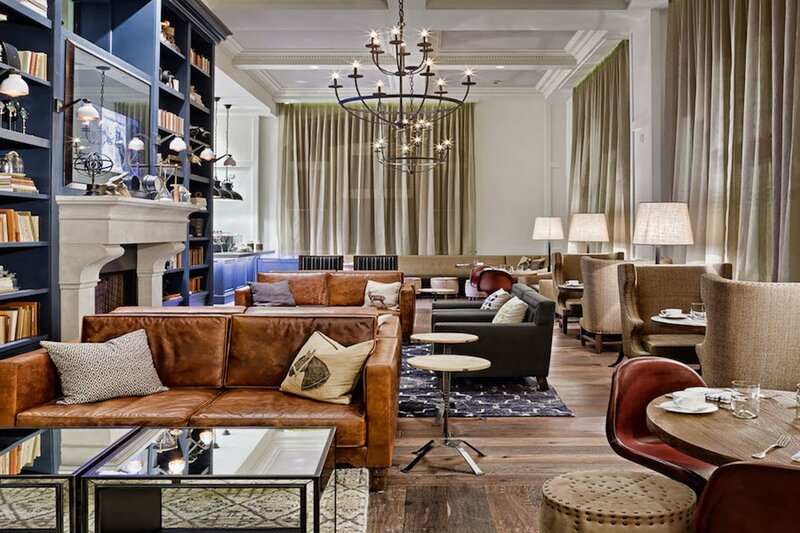 Loungey restaurants serving eclectic cocktails and live jazz. Denver is more than meets the eye. Seasoned skier Jean Tang shows us what happens when the winter wonderland thaws for summer vacation. DENVER – Perpetually on layover to some ski town, I was prompted on a recent family trip to check out Denver in the summer. The city is sunny, young, hyper-energetic, and super-expansive. What you'll need: A car. And remember that it is literally a mile high, so stay hydrated and well-rested to avoid the effects of the altitude. Approaching just a million residents, Denver is the biggest city in Colorado — and one that has forgotten neither its cowboy roots nor its Native American heritage. For non-rodeo types like myself, the city's offerings include world-class jazz, incredible food, and a refreshingly thorough art museum. Grab oysters and a beer to go. Photo courtesy of Cart-Driver. Food-preneurs have reclaimed a 19th-century brick foundry in the burgeoning River North (RiNo) neighborhood and now call it The Source. Anchored by two restaurants (Comida and Acorn), the conglomeration of fifteen-odd shops also include a French bakery, a design store, a micro-brewery focused on Belgian-style sours, a cocktail bar and snackery without walls, a homemade doughnut shop, and the occasional trunk show. Hail an Uber from downtown, then grab a Car 2 Go for the ride back — the little smart cars live in the adjacent lot. And for goodness sake, bring your appetite. These days, a true supper club is a rare thing. So I was surprised to find that Denver has one and that it comes with a worthy kitchen and impressive wine list. The year-old Nocturne Jazz is remarkable. Even if you're not in Denver, I'd recommend a detour to check it out. I expected the jazz to be good, and got my wish with a night of Charlie Parker by the John Gunther Quartet. But I didn't expect the food to blow me away. Owners Scott and Nicole Mattson have racked up more than twenty local and national awards by combining great local dishes with top culinary talent, an intimate space and stage, and the pacing of a confident kitchen. 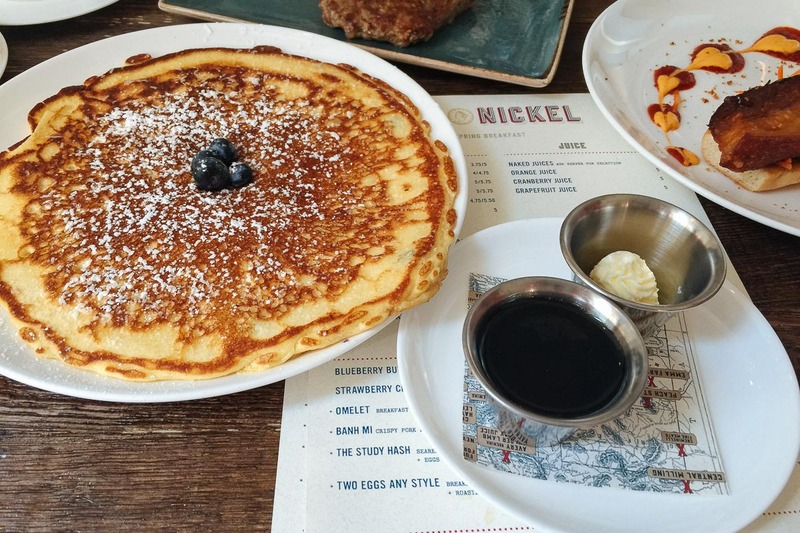 Pancakes for breakfast at Nickel. Photo by Jean Tang. Two massive buildings linked by a sky bridge make up the Denver Art Museum (DAM). It's possible to spend hours examining floor after floor packed with Asian art, Impressionist works, landscape photography, sculpture, western paintings, video installations, and special exhibits. But for me, the real draw is the Native American art. Hand-carved totems tower above blankets and beadwork, and special displays include porcupine headpieces, costumes rimmed with jingle bells, and other fascinating craftwork by Plains Indians, Arctic tribes, and more. Children and perpetual learners will be pleased to engage in tons of interactive studios — activities range from rug weaving to beadwork. Formed by nature and capitalized on by the local government, the Red Rocks Amphitheatre is an open-air stage nestled in a breathtaking rock structure, an incredible place to experience concerts, movies, even early morning yoga. Slanting rocks form an acoustic basin keeps sound surprisingly crisp within and echoing surreally without. The venue turns 75 this year and is celebrating by hosting near-daily events. Get tickets well in advance (designated ticket resale areas and roadside desperados serve as testaments to events selling out quickly) and wear hiking shoes. It's a light uphill trek from the parking areas, but a breathtaking one with copper hued rock shelves rising and dipping beyond view. 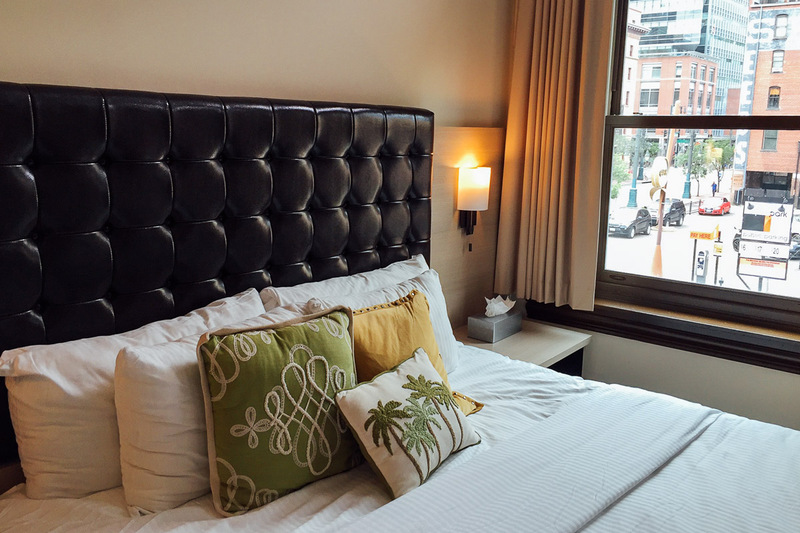 Located on the site of Denver's former tramway (which once cost just a nickel to ride), Hotel Teatro has 110 rooms and a leather-appointed study (appropriate for reading or breakfast) just blocks from the convention and performing arts centers downtown. I loved our spacious bathroom with its tub for two. Nickel takes local sourcing and expert execution more seriously than many hotel restaurants. I recommend the fresh breakfast sausage patty, platter-sized blueberry pancakes, and paper-thin charcuterie, all available through room service. The hotel's courtesy car, authorized for a two-mile radius, keeps things convenient when you don't have your own, or want to fully enjoy a night out. With its tall tufted chairs and vintage mirror collages, an Alice in Wonderland vibe permeates the lower downtown (LoDo) hotel NATIV. Rooms are compact but well-designed: Two-sided shower glass gazes directly into bedrooms, maximizing the feel of a bigger space. If you're here on a Friday or Saturday night, ask for a third- or fourth-floor room that faces the rear. On those nights, a nightclub thrums in the lobby until 2 a.m.
Get cozy at NATIV hotel. Photo by Jean Tang. Restauranteur Tommy Lee gained a name for the pan-Asian Uncle, but his latest venture, called Hop Alley, is a nod to his Chinese roots. 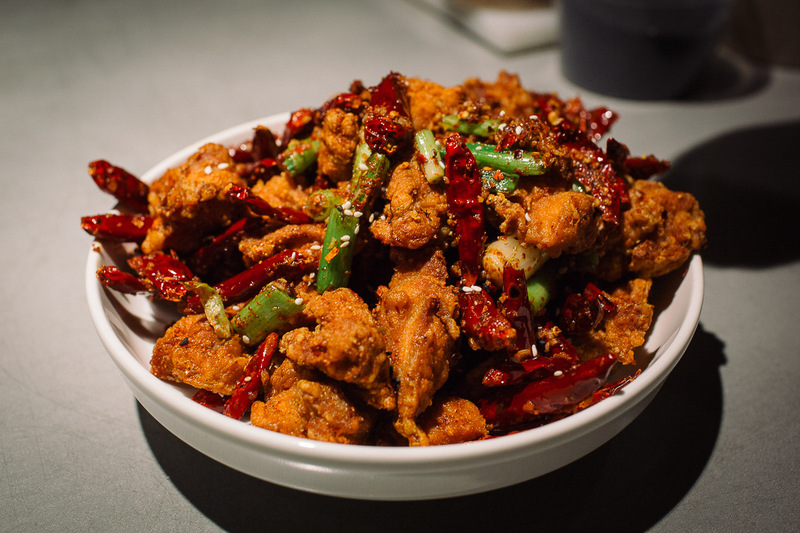 Located in a former soy sauce factory, the restaurant identified and innovated on fifteen authentic dishes across Chinese provinces, including Canton, Sichuan, and Taiwan. We loved the juicy, sliced pork chop, the fiery (and numbing) Sichuan fried chicken, and the cold tofu in nutty sesame sauce with outsized chunks of cucumber. I washed mine down with a well-made, not-too-sweet passion fruit cocktail that came vacuum-sealed in plastic with a straw, like bubble tea. At Nocturne Jazz & Supper Club, Chef Dustin Beckner sources his ingredients from local farms and crafts his own bread, cheese, and pasta. The tasting menu conjures five well-composed courses for an incredible $49. The elements we tried were mind-boggling, from a bright spring pea terrine accompanied with a velvety truffle-poached egg, to a saffron mussel soup surrounded by pickled mussels and tart, crisp peppers. House-made mozzarella, tucked in a dense and peppery muffaletta, sprang back from the touch. The bruschetta was creamy with (also house-made) ricotta, crunchy with salt, meaty with shaved speck, and bracing with fresh horseradish grated like bonito flakes and sprinkled like fallen snow. I recommend the god-like brunch at Beast + Bottle — shredded lamb shank hash, over-medium egg, and crisped pork confit on a bed polenta and sweet peas. Bathrooms are papered with NYC menus and the dining room and curved are very pleasant to be in. 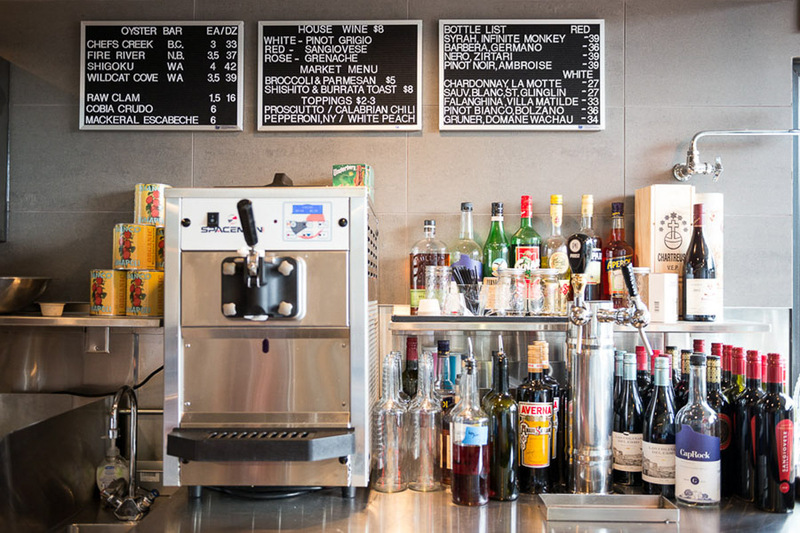 Cart-Driver is housed in a 640-square-foot shipping container, and this smoke-scented, pint-sized pizzeria and oyster bar embodies the portability of its name. It's open seven days a week, from 12 p.m. to 12 a.m., and showcases four different oyster varieties each night. My favorite was Sea Cow from Washington state, dusted with white horseradish shavings. Neapolitan thin-crust pizzas are shaped before you on marble, laid on a pizza peel, blistered in a 1,100-degree wood-fired oven, and served on butcher paper in a cast iron pan. We added spicy sausage to one of the rare red-sauce pizzas, and enjoyed the lasting tang of pickled Calabrian chilis. Start your meal with lightly dilled pickles, and, if available, tip back the iced black tea infused with basil and strawberries. James Beard has decorated Rioja and its California-born chef, Jennifer Jasinski, several times over. Steer clear of overly ambitious-sounding entrees like the piled-on ribeye and scallops with eggplant spanikopita. I'd recommend eating on the more casual side of the bifurcated dining room and getting the remarkable poblano corn soup, delicate yuzu hamachi crudo, velvety artichoke tortelloni, and tiny blueberry-cheesecake. 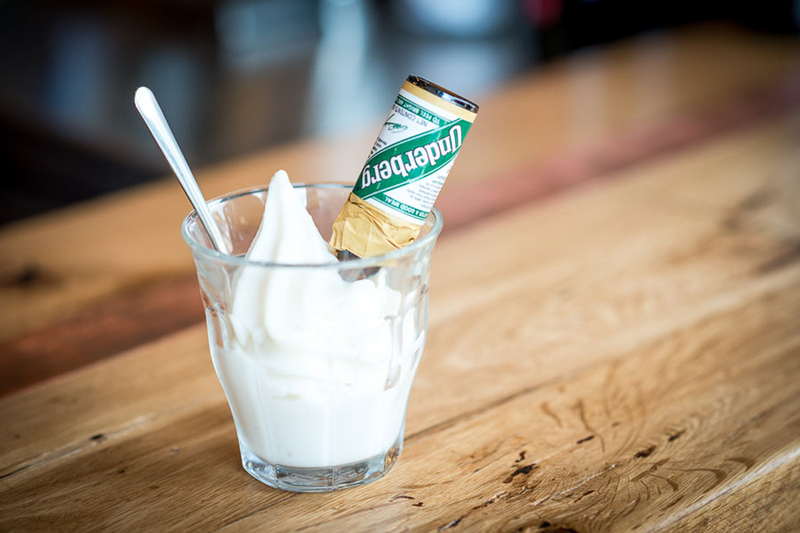 Stay cool with an ice-cream float. Photo courtesy of Cart-Driver. Meaty, seasame-drenched goodness. Photo courtesy of Hop Alley. Fly directly to Denver International Airport (DEN), then either rent a car or catch a regional train (RTD line) to Union Station, downtown, or elsewhere for around $9. A car is the most convenient way to travel. You can also rent one of the many B-cycles for half-hours at a time. With over 300 days of sunshine, Denver is one of the most rain-free cities in the world. Ski season keeps things lively in winter, but I recommend early summer for the long hours of daylight, hot but dry peak hours, and evening breezes. This is not a dressed-up town. In summer, tank tops, Teva sandals, and khaki shorts are completely appropriate. Make things a bit more formal with a casual summer dress, white slacks with wedge sandals, or a polo shirt and slacks for men. Bring a hat: The sun beats down.